Witnesses say that rapper French Montana's entourage was getting off their tour bus when someone opened fire. Rapper French Montana Says Shooting Was "Random"
After being questioned all night by police, rapper French Montana says his crew had nothing to do with a deadly shooting that happened last night outside the Holiday Inn on Penn's Landing. Police say that Montana's tour bus was surrounded by friends and fans at the time of the shooting. The rapper's entourage was getting off their tour bus at the hotel on Columbus Boulevard and Race Street after a performance at the TLA last night when a passenger in a black four-door sedan rolled down his window and opened fire, Homicide Captain James Clark said in a news conference. Jowann King, 26, from Flushing, N.Y. was shot in the stomach, according to authorities. He was rushed to Hahnemann University Hospital were he was pronounced dead. A second man, 28, was also hit in the shoulder. He was treated at Jefferson University Hospital and released shortly after, police said. Police say that shooting happened outside of Rapper French Montana's tour bus last night. NBC10's Luann Cahn asked the rapper what he'll do next. "I finish my tour and drop my album," said Montana, "I ain't got no worries." Montana says he didn't know the person that died. Investigators say Montana and Philly rap phenom Meek Mill were on the bus when the murder occured. Montana told investigators he didn't even know what was happening outside until his entourage told him. A man was shot and killed outside of the rapper's tour bus overnight. Police questioned Montana and his entourage until just before 11 a.m.
"It's just ignorant. You fire into a crowd and you're gonna hit somebody. In this case, unfortunately, someone was killed. Don't know if they had anything to do with anything, if they were a fan or what," said Police Commissioner Charles Ramsey. 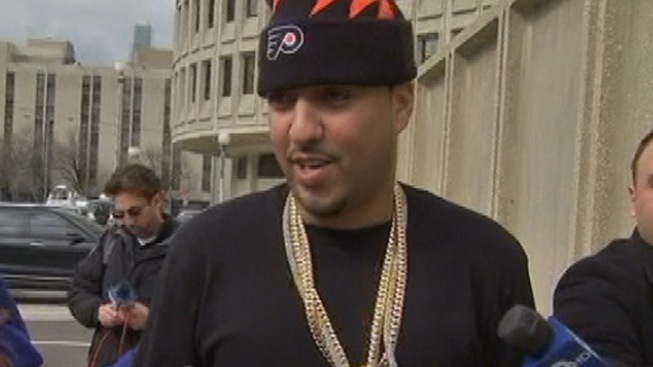 French Montana was questioned through the night and for the better part of the morning. Some of his entourage and fans are still being questioned. Investigators say two people returned fire after the intial shots rang out. Three people were taken into custody for carrying guns. So far, there are no suspects in the deadly shooting. "...When you find people like that, they should just never see the light of day again. I mean that kind of behavior's just unacceptable. For me, there's just no rehabilitation for anything like that," Ramsey said. Police say that the rapper and his entourage are cooperating with investigators. Montana is a Moroccan-born rapper currently signed with Bad Boy Records, according to his bio. His debut album featuring Nicki Minaj is scheduled to drop on May 21. He, along with his group, the Coke Boys, are supposed to perform in Boston tonight. "I'd like to give them [the victim's family] my regards," Montana told NBC10's Monique Braxton. Police are unsure If there was an intended target. "We're still interviewing a lot of people...We don't know who was targeted, we have no idea. The investigation is still very much ongoing," Captain Clark said. They do confirm that several hundred people were around at the time of the shooting and they're asking anyone with information to come forward.